Wabash College Professor William C. Placher has received the Indiana Humanities Award from the Indiana Humanities Council, which honors leaders in contemporary American society who exemplify thoughtful leadership and character. Placher, Lafollette Distinguished Professor in the Humanities, received the award Wednesday at the Indiana Leadership Summit, a premier annual leadership event that convenes over 500 corporate, government, education, and non-profit leaders from across Indiana. 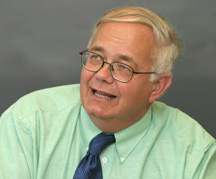 "Bill Placher’s teaching, writing, and thought prepare Wabash students, national scholars, and people of many faith traditions for humanistic leadership in society," said Wabash College Dean Raymond B. Williams, who spent more than 25 years as Placher’s colleague in the Philosophy and Religion Department at Wabash. The Indiana Humanities Award recognizes outstanding scholars and academic leaders in the field of the humanities whose teaching, writing, and thought help to prepare future humanistic leaders in society. Placher is one of five recipients of the award’s inaugural presentation. "We now need—more than ever before—the skills of humane judgment that the humanities help develop; guiding us back from information on the Internet to the knowledge embedded in books and moving on to the kind of practical wisdom that has historically made America both stable and innovative," said James Billington, Librarian of Congress, whose ideals guide the Indiana Humanities Council in the selection of the award recipients. Placher is author and editor of eleven books, including A History of Christian Theology, used as a resource in many academic settings; Jesus the Savior: The Meaning of Jesus Christ for Christian Faith; and Callings: Twenty Centuries of Christian Wisdom on Vocation, funded by Lilly Endowment Inc. He also edited Essentials in Christian Theology, honored in 2004 by the conservative magazine Christianity Today and the liberal journal Christian Century as one of the year’s outstanding books. His works on religion and theology reach a wide audience in the academy, church, and the wider society. He has served on the Visiting Committee for Harvard Divinity School and as a consultant to Lilly Endowment. For many years he has been a member of the Center of Theological Inquiry at Princeton and he serves on the Advisory Board of the Wabash Center for Teaching and Learning in Theology and Religion. The American Academy of Religion, a scholarly society with 10,000 members, awarded him the Excellence in Teaching Award in 2002. "In his quiet and unassuming way, Bill Placher has a greater national impact on the humanities in colleges and universities and on theological reflection in theological schools and churches than any theologian I know," added Dean Williams. "His intellectual leadership in the College and influence on Wabash students for several decades has been profound." Placher is a 1970 Phi Beta Kappa graduate of Wabash College, where he majored in religion. He earned his master’s degree and Ph.D. from Yale University, and joined the Wabash College faculty in 1975.